These little Italian meatball sliders are the absolute perfect appetizer. Loaded with melted mozzarella, and other Italian cheeses and a fresh tomato basil sauce on a perfectly warm brioche bun, you will be instantly addicted to these flavorful sliders. Wondering what the trick to light and airy meatballs is? It's all about the way you handle the meat! As soon as you get too handsy with the beef, it will break down the proteins and create dense, hockey-puck like meatballs. To create fluffy yet compact meatballs, don't overwork it! Preheat oven to 450 F. Oil a baking sheet and set aside. In a large bowl, gently combine ground beef, ricotta, egg, bread crumbs, parsley, oregano, salt and the red pepper flakes. Roll into 6 small even balls and set on the baking sheet - making sure that they touch one another. Bake for 20 minutes or until cooked through, firm and browned. Add olive oil and thinly sliced garlic to a sauce pan. Let cook for a minute or two over medium heat unit the garlic becomes fragrant but not brown. Add a pinch of red pepper flakes and the box of Pomi tomatoes. Stir and let cook for 15 minutes. Add butter and basil and stir to combine. Set aside. Turn your broiler to high. Arrange 6 brioche buns, open faced, and set on a baking sheet. On the top buns, add 1 tbsp of tomato sauce and evenly distribute the Italian cheese blend. On the bottom buns, add another 1 tbsp of the tomato sauce and place the cooked meatball on top. 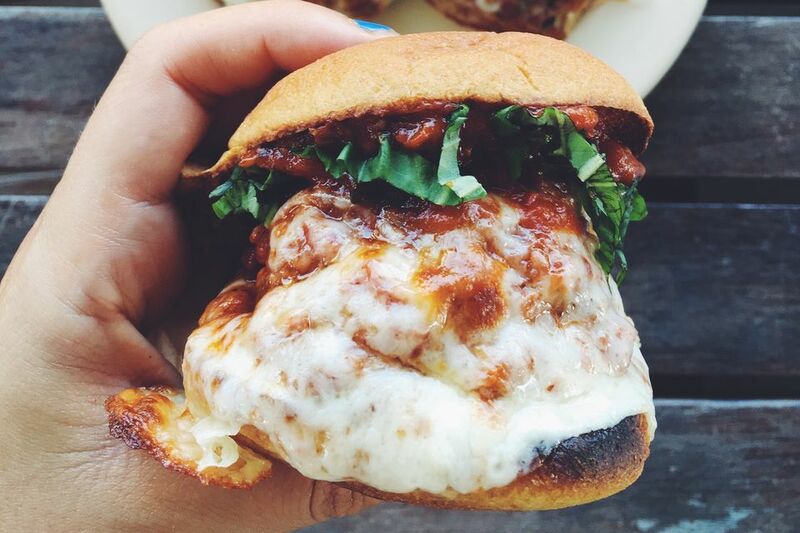 Top the meatball with the fresh mozzarella slices and a sprinkle of salt. Broil the sandwiches for a few minutes until the cheese starts to bubble and get crispy. Remove from the oven, put some basil on top of the meatballs and close up the slider sandwiches. Enjoy!